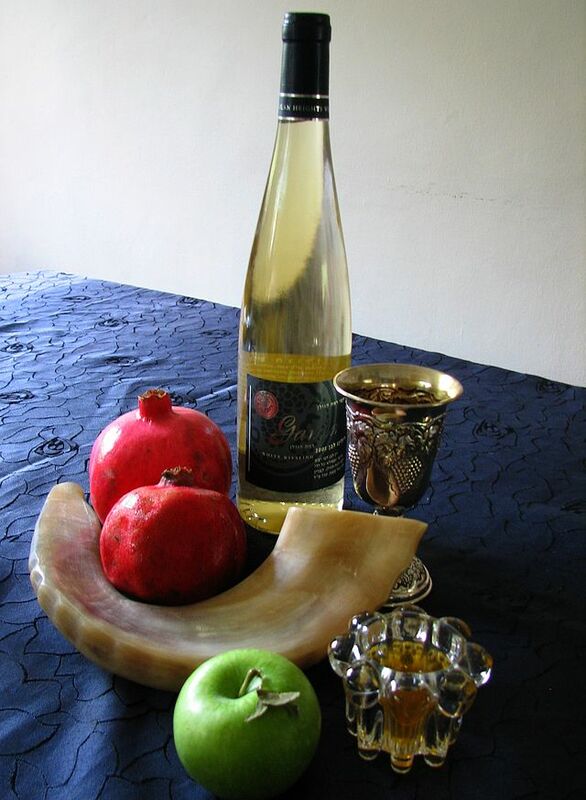 I always find it interesting that the Jewish New Year starts in the fall. The timing made more sense in California, where the New Year coincided with the start of the rainy season, as it does in Israel. When the brown land becomes green, the year feels new! 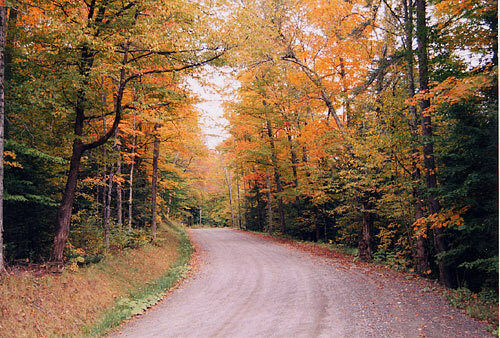 In Vermont, the New Year comes at a very festive season: foliage season, harvest season. A time for enjoying the cool weather and the beautiful trees. A time for going apple-picking or at least buying local apples. 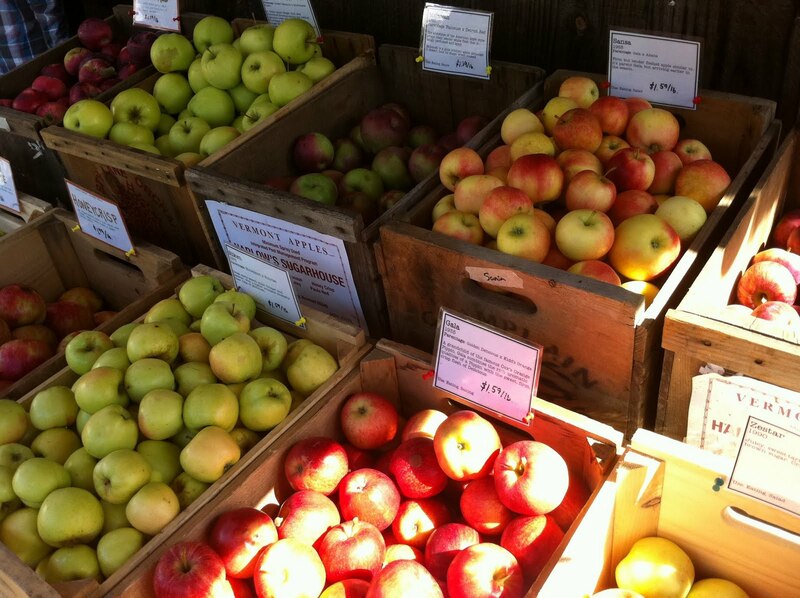 I include a picture from my local farmstand: Killdeer Farms of Norwich. Still, compared to brown-land-becoming-green, sometimes it doesn't feel quite like a New Year in the fall. This year, however, New Year in Vermont feels very new. 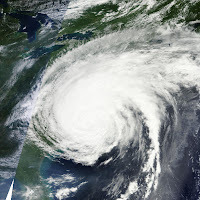 We are recovering from Hurricane Irene. The roads are open. People are planning again, holding meetings, holding rallies. It feels like getting over an illness. A feeling of exuberance and joy. May all my readers have a healthy and joyful year. A good and sweet year. A good and peaceful life. Top photo: Traditional Rosh Hashanah foods, from Wikipedia. Apples, honey, wine, and pomegranates. Also, a shofar (ram's horn), a traditional part of the holiday celebration. Bottom photo: Vermont Apples, from Killdeer Farm Facebook page. 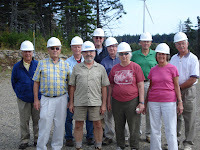 Yesterday, the Energy Safari course went to Lempster Wind Farm in Lempster, NH. 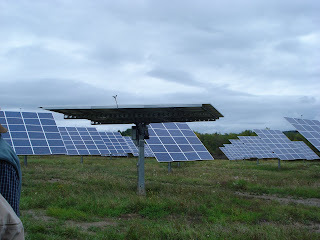 We went on a lovely sunny day, which would have been great for the solar farm visit last week. Unfortunately, we went to the solar farm in the rain, and the wind farm on a clear, sunny day with almost no wind! 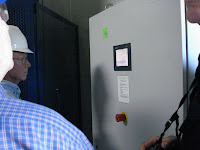 Bob Hargraves did an excellent blog post on our visit at the Energy Safari site. I am just adding my impressions. 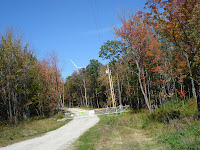 The picture above shows the entrance to the wind facility. (If you enlarge it, you can see one of the turbines.) Unlike the solar farm, which is just a short walk from a few houses, with no locked gate, the wind facility is more heavily protected. There are moving parts overhead (it's all a hard-hat area) and people are not allowed to wander around it by themselves. Several landowners still live within the wind farm boundaries, and I assume they can do as they choose about hard hats. (They probably signed something about liability. I am just guessing.) We were tourists, and we were well guided. Ed Cherian was the construction manager for the project, and he was our knowledgeable, patient and gracious host. I admit I am rather fond of the photo on the right. 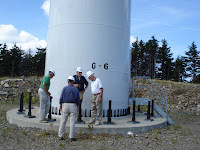 We are standing at the base of one wind turbine, looking over at another wind turbine, and in between is a solar array to run a private communications tower. We had a great time and lots of access at the wind facility. At the left, you can see that they allowed us inside the turbine building. There's a readout there of the power production for the turbine. "Our turbine" went from negative production to positive production while we were there, as the wind picked up. Readout below. However, I did find it frustrating that the owners would not tell us the price at which they sold their power. They don't have to tell us, I know. They are a private company, and have every right to their trade secrets. Bigger companies, like Hydro Quebec, also do not share that information. We don't have any right to have that information. 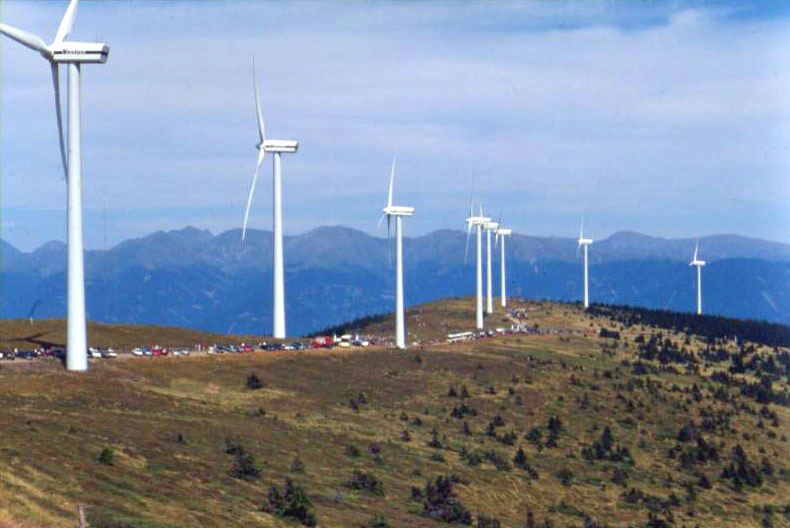 However, we are the "energy safari" course and it just makes it harder to assess the success of the first wind project in New Hampshire. In contrast, the solar farm sells their power according to the Vermont SPEED program. The solar farm people were quite straightforward about their production and prices. 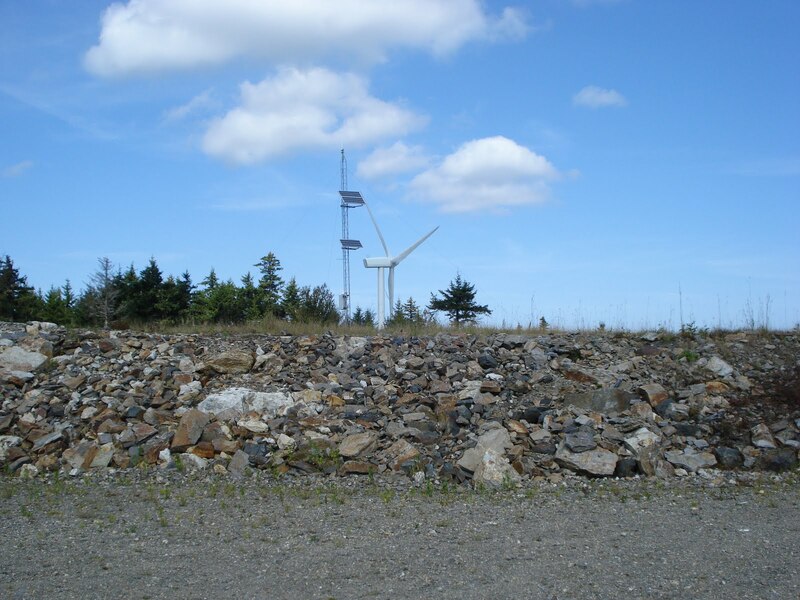 The wind turbine base is sunk with 40 foot bolts into solid bedrock. The turbine itself is bolted to the concrete base. The bolts are covered with black plastic because otherwise they tend to collect minerals and salt, and therefore they attract moose. There's a lot of wildlife around the windfarm. 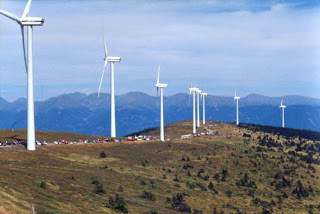 Factoid time: Why are wind turbines white or light grey? It's an FAA rule for pilot safety. I will finish with the obligatory picture of the jolly group! For a more complete assessment of the visit, please go to Bob Hargraves excellent write-up. We are grateful to Iberdrola Renewables for the opportunity to visit their facility. Out on a hillside on a sunny autumn day in New Hampshire! It hardly gets better than this! All pictures are my own. Click on any picture to enlarge it. Today I was a guest blogger at ANS Nuclear Cafe. (ANS is the American Nuclear Society). 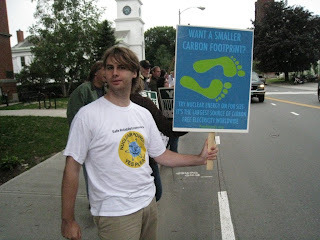 I blogged about the pro-nuclear rally that we held earlier this month in Brattleboro. When I blog for ANS Nuclear Cafe, I can be certain that most of the readers are in favor of nuclear energy, but that few of the readers are up-to-date on Vermont. So my ANS posts have a somewhat different slant. In this post, I wrote more about our motivation for the rally, and how we felt about it afterwards. 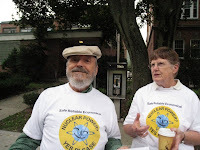 I hope my regular YesVY readers will enjoy my post on the ANS blog: Rally for Nuclear Power and Vermont Yankee. The lower right-hand picture shows my husband, George T. Angwin, and Mary Daly, a recent candidate for the legislature. It's not the best picture of either of them, but it is the picture I have from the rally, so I thought I would include it here. For me, it brings back very good memories of that morning. The 71st Carnival of Nuclear Enegy Blogs is now posted at NEI Nuclear Notes. David Bradish has assembled a thoughtful and very readable Carnival, with the subheading: Critical Reviews, History and Future Stuff. History includes understanding Siemen's exit from the nuclear industry, courtesy of Dan Yurman's Idaho Samizdat. Siemens claims that they left the industry because of Fukushima, but maybe they just didn't want to compete with Areva? In another historical article, Will Davis at APR Atomic Journal uses newly-discovered information to describe the Elk River Nuclear Plant, built in the late 50s and early 60s. This was one of the earliest power reactors in the world, and an early pioneer in a uranium thorium fuel cycle. However, in my mind, the true historical block-buster article was Brian Wang at Next Big Future, showing that an early nuclear researcher knowingly lied, claiming that even low levels of radiation were dangerous. This researcher suppressed data that low levels of radiation are benign. His aim was to help stop above-ground atomic testing. This was a good thing to do. However, suppressing data has consequences, and one of the consequences of this choice was the early adoption of the LNT (linear no threshold) model of harm from radiation. The Future includes upbeat information on the continuing builds in China (Next Big Future), nuclear-powered cruise ships (Margaret Harding at Four-Factor Consulting) and cost-effective Generation IV Nuclear Technology (Charles Barton at Nuclear Green). The future of nuclear looks pretty darn good! The Review section is full of interesting stories. Steve Skutnik at Neutron Economy reviewed the book Uranium, and had a comment on his blog from the book's author. Rod Adams considers the companies and individuals who benefit from higher fossil fuel prices, and Steve Aplin reviews the Canadian Auto Workers alliance with a renewable energy association. The auto workers think renewable energy will create jobs: Steve begs to differ. Gail Marcus at Nuke Power Talk takes an inside look at the EIA's energy projection process. Considering how often I personally refer to EIA data as a gold standard, this is not a pretty sight. 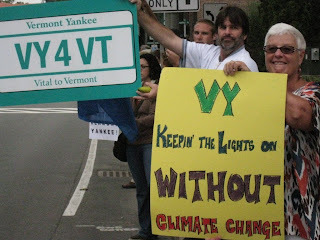 On my own blog, I review the Vermont Energy Plan. Since the plan has little content and almost no numbers, it was a quick job to review it. NEI has hosted a fascinating Carnival. Enjoy it in the comfort of your own home. No pitchmen will attempt to sell you anything! The information is carefully prepared and free! I wish Vermont had a governor who was a class act. I wish Shumlin was the kind of politician who does the right thing in public. The kind of politician who does the courteous thing. The kind of politician whose public face is thoughtful and non-vindictive. You understand that I am saying "I wish we had the kind of politician who..." I do not expect that all politicians are wonderful people. I just expect that politicians will behave in a certain way in public because it is politically wise to do so. We don't have that kind of governor. Hurricane Irene did a lot of damage in Vermont. Hundreds of people lost their homes. There was a major need for disaster relief. In response, people and businesses have donated time and money to help those who have suffered. Governor Shumlin recently held a press conference to thank the Vermont businesses who contributed large amounts to disaster relief. Shumlin thanked Vermont Public Radio for hosting a $625,000 fundraiser; Blue Cross Blue Shield for giving $150,000; ICG software for giving $30,000; and Coca Cola for giving $25,000. He thanked many other businesses for their contributions also. He didn't thank Entergy. He didn't even mention Entergy. Entergy donated $50,000 to United Way of Windham County and also provided a matching grant of up to $50,000. Windham County is Shumlin's home county. All in all, Entergy contributed up to $100,000, depending on how well United Way is able to match part of the grant. Shumlin didn't mention Entergy when he listed the businesses who helped their neighbors by giving large donations. Would it have hurt Shumlin to list Entergy along with the others? I don't think so. Nobody would think that including Entergy's donation in a list would mean that Shumlin loves Vermont Yankee. Listing Entergy's donation wouldn't have hurt the state's case in the lawsuit. It wouldn't have hurt anything. It would just have acknowledged a major donation. Instead, Shumlin had to be petty and leave Entergy out of the list. I hope our next governor is more of a class act. Update: Shay Totten of 7 Days wrote an excellent post about this snub to Entergy (snub is his word and I agree). Among other things, Totten found that Entergy had donated $130,000 to local charities, just for disaster relief.. This is an edited version of an article I wrote for True North Reports. The picture in that article was correctly critiqued by Rod Adams, so this version has a better picture. Pro-Vermont Yankee people on the right side of the picture, opponents on the left side. On Monday, September 12, the lawsuit between Vermont Yankee and the State of Vermont began at the federal courthouse in Brattleboro, Vermont. The "Safe and Green Campaign", an opponent group, announced they were holding a "silent vigil" in front of the Courthouse from 7:30 to 9 a.m. that day, just before the hearing started. The group had held a similar vigil in June, when the preliminary injunction hearings took place. 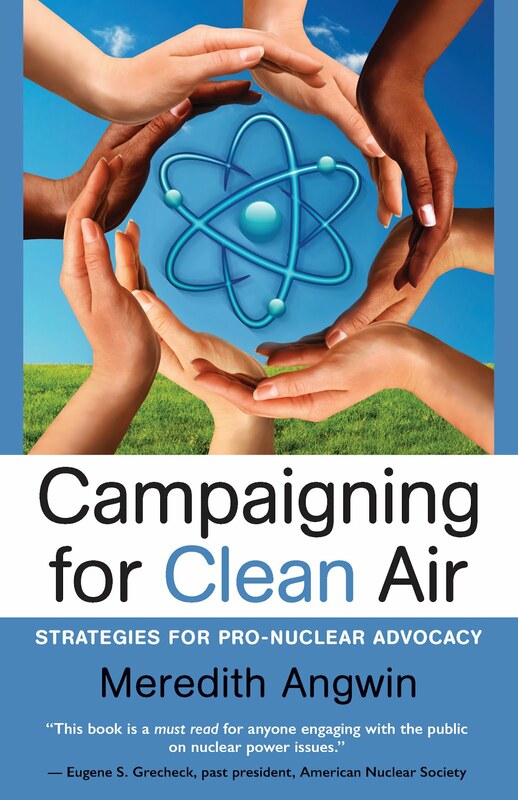 Nuclear energy has supporters, but they are seldom visible. The opponents organize marches, vigils, skits, demonstrations, and puppet shows. Some of us decided to hold a rally to help correct the visibility balance. Rally participants came from the Energy Education Project of the Ethan Allen Institute, the Vermont Pilot Project of the American Nuclear Society, and the Coalition for Energy Solutions. 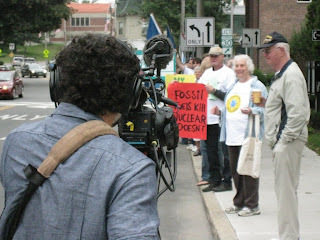 Many people support nuclear, and by 7:30 a.m. there were about 25 of our group on the sidewalk in Brattleboro. We had decided to stand across the street from the Courthouse: we had several practical reasons. Where we stood, we weren't blocking the Courthouse steps. There was "no parking" on our side of the street, so our signs would be more visible. Furthermore, when we arrived, a green pickup truck was already further down the block on our side of the street. 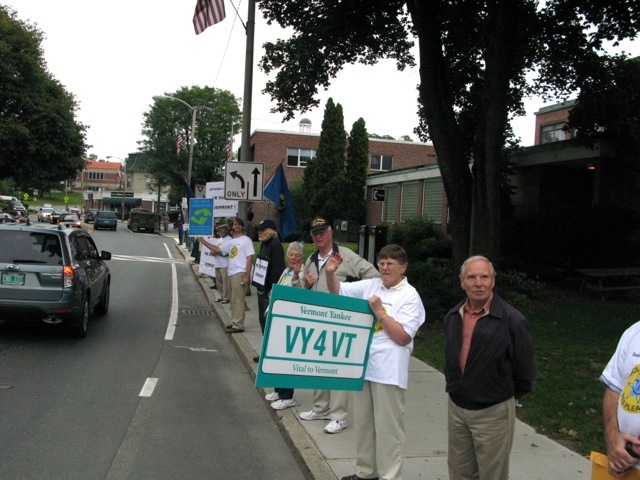 It had several green VY4VT signs, and was driven by a representative of the Vermont Yankee union, the IBEW. The pick-up was not there by chance. We had asked if some people from IBEW might come, and they came to support us! At first, there were more supporters than opponents. Most, but not all, of the opponents stood on the other side of the street, near the Courthouse. More and more opponents came as the morning wore on. By the time we left at 9 a.m., we were outnumbered, probably 60 to 25. However, we were still a big group and very visible. As we waved at the cars going by, we got many waves and "thumbs-up" from the drivers. One young woman who was walking by asked for a pro-Vermont Yankee sticker and she carefully attached it to her backpack. We had excellent signs, and white t-shirts saying "Nuclear Power Yes Please." I had briefed everyone before the rally about the opponent's love of "street theater." We had all agreed to walk away from any confrontation. We weren't there to argue. In general, things were calm, but not always. One of the opponents came to our side of the street, holding a large sign. He positioned himself on the street, standing in front of one of the women in our group, who was standing on the sidewalk. He held his sign up, and hid her from passing traffic. She objected, and told him he was being very rude. He said he was doing this because he loved democracy. Since she has served in the state house, this "love of democracy" business was not going over with her! I dashed over and headed off the argument, allowing him the victory. However, a certain amount of escalation followed, with people from their side coming over and people from our side stepping into the street to remain visible. Eventually, the police told everybody to stay on the sidewalk! That was a good thing! Interestingly, many of the opponents were carrying Vermont flags, "Supporting Vermont" in the lawsuit. One opponent had a sign, "State's Rights Trump Feds." (You can see the sign in the this video.) I was a young adult in the 1970s, and the sight of counter-culture demonstrators with state flags and "state's rights" signs made my head spin! I also knew that some of the people waving Vermont flags lived in Massachusetts and New Hampshire. I live in Vermont, and I should have had a flag! 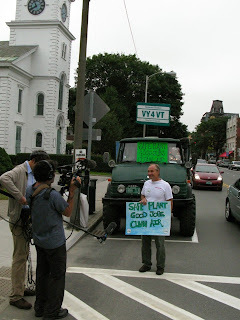 After all, by supporting Vermont Yankee, I support clean air and a good economy for Vermont. I support Vermont! Afterwards, some of us had breakfast together. We were a jolly and enthusiastic group, who felt we had made a difference. We had made nuclear supporters visible. People had honked and waved at us. We were a presence. At breakfast, several people asked: "When are we going to do this again?" This is a Youtube of a recent concert in Brattleboro. The concert was the main event at the Positively Charged Music Festival. The purpose of the festival is to kick off a citizen effort to be sure Vermont Yankee closes in March, as reported in the Brattleboro Commons. In that article, Dan DeWalt, the concert organizer, describes the current lawsuit as a blatant attempt by Entergy Nuclear of Louisiana to use the right-leaning federal court system to usurp Vermont law. Well, so much for the Constitution and the balance of powers. If you want to hear DeWalt's plans for Vermont Yankee, move the slider to about the 4 minute mark and listen. Amusingly, he talks about the recent demonstration at Vermont Yankee, and states that some people knew and some people didn't know about the activists who were arrested at that day. He doesn't note that the activists got very little publicity because they chose to hold a demonstration and be arrested the first day after the hurricane was over. Reporters and first responders were busy elsewhere! That day, first responders were evacuating people from dangerous situations, bringing supplies to areas that were cut off, and so forth. These activists made sure that some first responders were kept busy at the plant, arresting them. Well, so much for caring about what happens to other people. DeWalt and other activists also told about their plans in an early-summer article in my local paper, the Valley News. What This Is About. What This Is NOT About. This is about the fact that some plant opponents will keep up their activities no matter what. 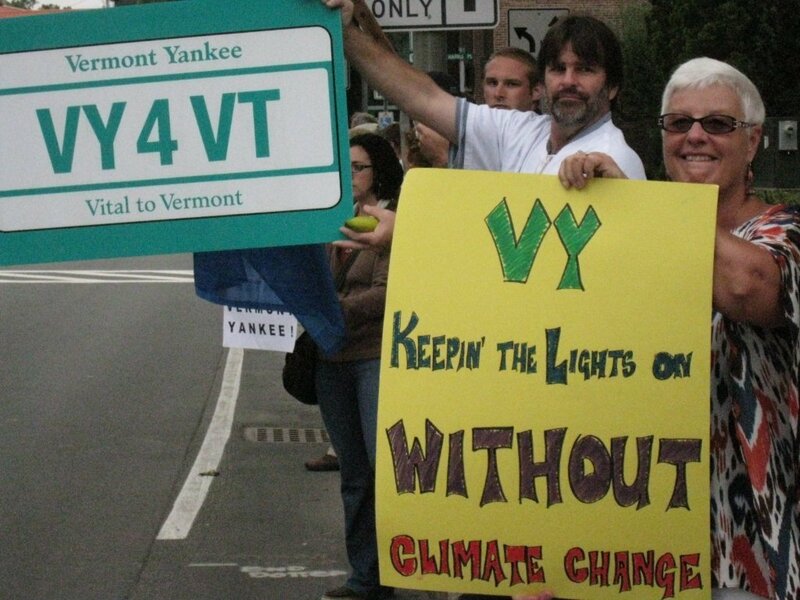 Neither law nor hurricanes will deter them from anti-Vermont Yankee activities. In response to this, plant supporters must encourage the rule of law, and must continue to be visible and present. In other words, we must write more letters to the editor and hold more rallies! This is not about blaming plant opponents for the recent arson fires at the plant headquarters. 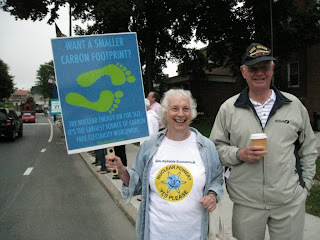 Every plant opponent spoke out against arson in a recent Brattleboro Reformer article, and I believe them. We will have to wait for the investigation to find out who did it. Free speech against the plant is free speech. Arson is arson. Very very different. There's also a campaign of non-violent direct action to close Vermont Yankee, complete with an Action Camp for training. I don't think they train people to commit arson! We also have to guard against the situation I might call: "The Usual Suspects." After the Oklahoma City bombing, many people were sure that some Islamic group had done it. Actually, of course, it was a home-grown terrorist, Timothy McVeigh. Similarly, in this arson case, despite all the heated rhetoric against the plant, I suspect that the person who did it was some odd and disgruntled person. I don't think this person was connected to the opponent organizations. Hopefully, the investigation will find out who did it, and lay to rest any knee-jerk accusations. Just like the lawsuit outcome, at this point...we must simply await events. In the picture above, Andrew Savage of All Earth Renewables explains the Williston solar farm to our ILEAD class, Energy Safari. The All Earth Renewables website includes real-time energy production, showing excellent honesty and transparency. For a more complete explanation, including notes on capacity factors and so forth, I recommend Robert Hargraves post on the class blog. I don't have too much to add. Somehow, I didn't expect the solar farm to be in a suburban neighborhood. I don't know why not, I just didn't expect it. You get to the installation on a lane off a typical suburban cul-de-sac. The sun trackers are quite intricate, and they move every ten minutes or so. The slight noise of the movement is the only sound. This is the quietest power plant I have ever visited! Most of the parts of the suntrackers (the things that hold and move the panels) are made in Vermont. The panels themselves are made in China, but the panels are less than half the cost of the installations. People walk their dogs around the edges of the solar field. It is still very much "part of the neighborhood." 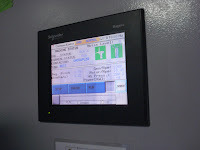 Each suntracker has an anemometer on it (easily visible in this picture of a suntracker panel in the horizontal position for an on-going test.) When the wind speed is above 30 mph, the panels are placed in a horizontal position to avoid damage. As Andrew Savage noted, however, high wind speeds are associated with storms and clouds. Therefore, moving the panels flat during high-wind incidents does not affect their long-range performance very much. 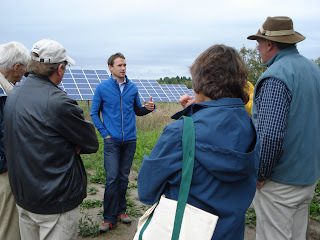 We are grateful to All Earth Renewables for hosting us, and also for their complete transparency on energy production. The Vermont Department of Public Service (DPS) has issued a draft Comprehensive Energy Plan for Vermont, and they have opened it for public comment. This document covers all types of energy use in Vermont: home heating, transportation, electricity. It is the document Governor Shumlin wanted: Vermont without Vermont Yankee. Now the DPS is asking for public comments on the document. DPS isn't hoping for too much public comment. On September 14, the Department of Public Service released the plan and the time schedule, and sent an email to that effect to selected organizations. The public comment period ends on October 10, less than a month later. The summary volume of the CEP is 19 pages. The main volume (volume 2) is 368 pages. The appendix volume is 200 pages, but seems to be a moving target. New information was added to the appendix after the original email was received. Read fast! People can comment through a website or email address, or you can go to meetings. There's a form on this Public Comment Page. There will be five public meetings, two of which are on Rosh Hashanah, and none of which is within fifty miles of my home. It does not mention natural gas. There are no quantities, dates or costs anywhere in this plan. They are not in the summary volume. I tried to find them in Volume Two (368 pages), but they aren't there, either. Volume Two is a list of Good Things We Will Do. 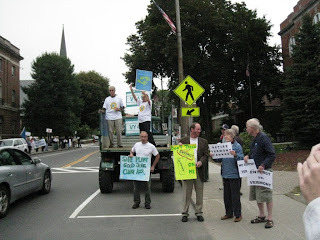 I am glad government workers will be encouraged to carpool, but that isn't going to replace Vermont Yankee. Add more renewables through expanding government support programs. Bring in that natural gas pipeline to fill the gap in the electricity supply. Read as much of the plan as you can, and give your opinion to DPS on the Public Comment Page. This picture is not how Vermont looks yet. We are just getting color at the high elevations now. It is early in the season. It is going to be spectacular season. I encourage everyone to visit. The roads are mostly open, as you can see by this Vermont Transportation Map. There are some roads near the Green Mountains that are limited traffic or closed (very few actually closed). But the you-can't-get-there-from-here feeling is over. In my own township, the Simon Pearce Restaurant has re-opened. The lower levels of the complex are still closed, but the restaurant and shops are open. In my August 28 post, I lamented that restaurant closing. It is quite near the Quechee Bridge, a covered bridge which was heavily damaged. But the restaurant is open again! Pretty much everything is open again. The Tucker Hill Inn, near Montpelier, has an update page, pointing out that it is open and had no damage. The Applebutter Inn, near Woodstock also has no damage, and the roads to it are open. Applebutter is owned by Michael Pacht and Barbara Barry. Michael sings in the same chorus as my husband. On his website, he notes that since no wind accompanied the rain, our maple trees are well watered! We look forward to a gloriously colorful foliage season. It is going to be a great foliage season. Here's a link to a foliage tracker: Early colors now on the hillsides. Other events are also on track. For example, Billings Farm Museum is holding its Quilt Show. 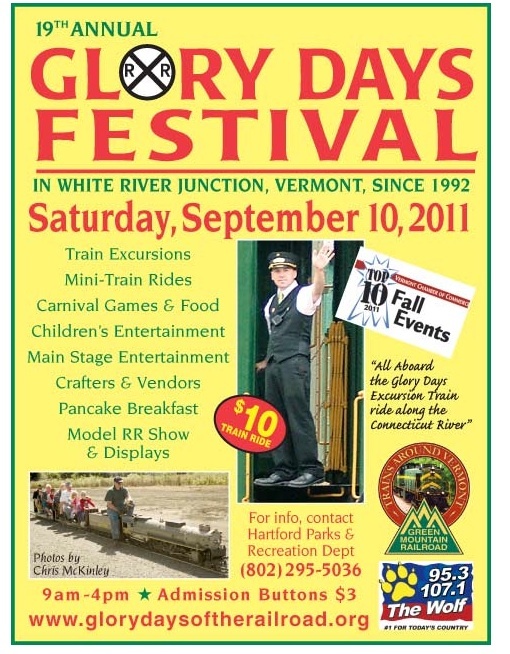 There's a lot to do in Vermont. In neighboring New Hampshire, there's a Goodnight Irene fundraiser at a local pub. You probably can't come to the fundraiser, and fundraisers are important for the people who lost their homes (about 700 homes) and businesses. Most people are okay, though. I am not hardhearted. I just want to say that most businesses are open. Most roads are open. You can come to Vermont and support all the businesses that need your support. It's going to be a great foliage season, partially because we had all that water. In a dry summer, the leaves get a little dry and brownish. Not this summer! The leaves are going to change spectacularly! 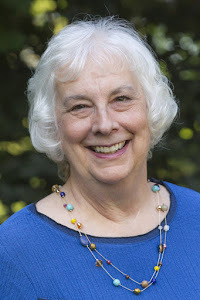 Photo from Vermont Living website. The Rally in front of the courthouse yesterday was a lot of fun! Here's the press release that announced it. It was fun because there were so many of us, and we were so visible, and we supported each other. We had about twenty-five people there: there were twenty on the sign-up list, and they all came and some brought friends. The Rally started at 7:30, and we had more people out there than the opponents did, by far. At 7:30. By 9, when court opened and we left, they had more people, but we were still a very major presence. Note the T-shirts. Note the truck, driven down by one of the men from the plant, representing IBEW. Great platform for us. Note some of the opponents standing in front of the truck. (They didn't make much headway where we were standing, and tended to go away after a while. They were in full force across the street.) Yeah, there is a picture with me in it, and a picture of Robbie Leppzer, the documentary maker, taking pix of us. Also, the blue banners are Vermont flags. The opponents carried them to show that they "support Vermont" in the lawsuit. Since we support Vermont, too, (though not in this lawsuit), I have wondered if we should have also "wrapped ourselves in the flag", as it were. Well, lessons for next time! We had a neat tri-fold brochure and a set of FAQs about Vermont Yankee. They are posted at the Energy Education Project website of the Ethan Allen Institute. George Angwin and Richard Schmidt were the main authors. 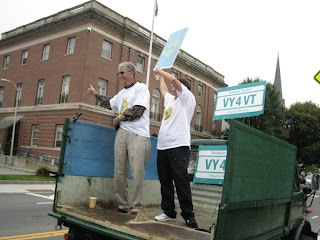 For updates on the trial, I recommend the Vermont Law School blog. They are live-blogging the trial. End note: I apologize for the formatting. I have never added this many pix to a blog post, and I am running out of time to make the formatting better. Today, the Entergy vs. Shumlin-and-Vermont lawsuit begins in Brattleboro. As this post is published, I will be down in Brattleboro, participating in a rally in support of nuclear energy and Vermont Yankee. Opponents will also be there. Here's a link to an article by Olga Peters about the lawsuit and various plans for other events. I am one of the nuclear supporters described as planning the "counter-vigil"on September 12. In my press release, I called it a rally, not a vigil. But what the heck. At least we were mentioned! There has been a fair amount of legal maneuvering before the trial. One issue has been the qualification of expert witnesses. This article (originally in the Brattleboro Reformer) describes Entergy attempting to disqualify three of the state's expert witnesses, and the state's answer to Entergy. The three witnesses that Entergy wanted to disqualify are Bruce Hinkley, Peter Bradford, and William Steinhurst. Here's a link to Hinkley's declarations about the preliminary injunction. I cannot find any similar filings by Bradford or Steinhurst on the Attorney General's website. Peter Bradford is a professor at Vermont Law School, and William Steinhurst is a consultant in energy regulation. Challenging expert witnesses before the trial is pretty standard stuff. As a matter of fact, it's called the Daubert standard. Well, it sounds like some of these guys are experts in law. The judge gets to decide the law. Judges don't allow "expert witnesses" to get involved in the judge's area of expertise! Lawyers, the legal team, argue legal matters before the judge. Expert witnesses don't testify about legal interpretations. Actually, these are the translations (into English) of the answers I got. My translations may be wrong. In which case, it is nobody's fault but my own. That's why they pay real lawyers the big bucks. Judge Murtha has already ruled on this matter, and you can see his direct ruling here. It is clear and simple and less than two pages. (Every now and again, I have hopes of understanding this stuff!) The ruling basically says that Judge Murtha will let them testify, but they better not testify about the law. To aid the parties in conducting expert depositions, however, the Court notes it will not consider expert testimony on purely legal issues and does not expect to hear such testimony at trial. Ultimate legal issues are matters that counsel can and should argue to the Court -- such matters do not require the imprimatur of an “expert.” Opining that state laws are not preempted is a legal conclusion and not helpful to the Court...The Court will hear testimony based on personal knowledge, experience in the nuclear industry, and research of legislative history but, as noted, the Court will not hear or rely upon opinions on ultimate legal issues to be determined by the Court. For a more light-hearted view of qualifying an expert witness, I include this two-minute clip from the movie My Cousin Vinny. The tenth year anniversary of that grim day. This week's New Yorker cover says so much: Reflection. September is the month of reflection. It contains September 11. It holds the beginning of the High Holy Days. On a personal note, September is our anniversary month, and our son's birthday month. September gives me many opportunities to reflect. Like the reflections of the New Yorker cover, the Towers are in my heart. What did I learn from 9/11? Things I learned, and that I manage to forget all the time. That some people are brave and disciplined, and willing to give up their lives for others (firemen and other first responders are people like this, and there are others). That hating whole groups of people is a worthless attitude. That being open to people is a worthwhile attitude. That not everyone loves us. Defense against enemies is a real-world requirement. That helping others is a real-world requirement. I see bumper stickers frequently: "9/11 was an inside job!" I think this is a very comforting belief for some people. With this belief, they don't have to learn how to live in a complex world where people have enemies as well as the requirement to be helpful to people. Once the conspiracy theorists have eliminated the idea that real enemies from another country did this, they can go right back to business-as-usual. They need only acknowledge the enemies they are comfortable with: business owners, the CIA, right-wing politicians, whatever. It's a little cocoon of beliefs, and the difficulties of the real world don't penetrate. In a similar manner, we have some women around here who like to get arrested at Vermont Yankee. A letter in True North Reports describes these women's activities during the flooding. I recommend reading the letter. On Tuesday August 30, first responders were busy with scenes like this in nearby Brattleboro, or scenes like this fly-over, further north in Rutland. 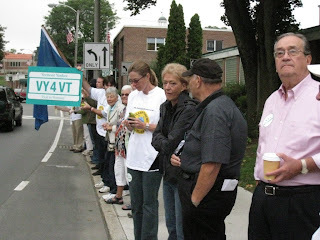 On August 30, these women marched into Vermont Yankee, chained a gate, and refused to unlock it or go away peacefully. Several policemen had to take time from rescuing people to cut the chain and arrest the women. These women had their comfortable enemies and their comfortable activities, and the suffering of other people during the storm didn't appear to matter to them. I think they have a mindset similar to that of conspiracy theory people. Conspiracy theorists tend to look down on the rest of us as as "not understanding" reality, "being fooled" by conspiracies. I think they cannot bend their minds and emotions to living in a complex world that contains enemies and floods and heroism and the requirement to be kind. By indulging in conspiracy theories, they feel they can choose their enemies, and they stay in their comfort zone. I think that today is a day to acknowledge reality, not conspiracies. To understand that reality includes enemies, enemies not picked-and-chosen. Reality includes huge, deep sadness. Huge. As big as the hole at Ground Zero, and bigger. For me, reality includes the memory of the pervasive smell of decay and smouldering fires that lingered in New York for weeks. First responders saved many lives in Vermont. First responders died trying to save lives in New York. In a small return for the suffering, reality also gives us heroes. New Yorker cover from New Yorker website. 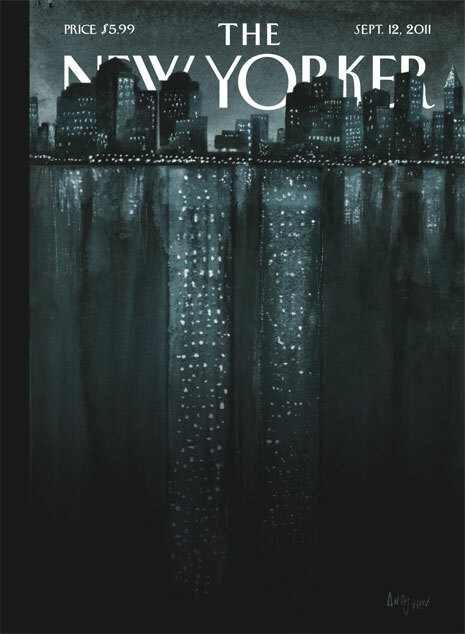 This is a web story about ten years of New Yorker covers on September 11, and well worth reviewing. 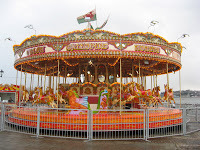 The Blog posts in the Carnival are terrific. Brain Wang, at Next Big Future, reviews a Japanese report on post-Fukushima nuclear economics. Even assuming a clean-up cost of over a hundred billion dollars, the cost of nuclear electricity in Japan is completely competitive with other sources of power. Meanwhile, something completely different: Gail Marcus at Nuke Power Talk describes one of the oldest uses for uranium: orange and yellow ceramic glazes. It's fun to read her post, and brought back my days studying geochemistry in grad school. The people in my lab studied minerals and geochemistry, and often published in the Journal of the American Ceramic Society. Ceramics and rocks are pretty much the same thing, not even two sides of the same coin. 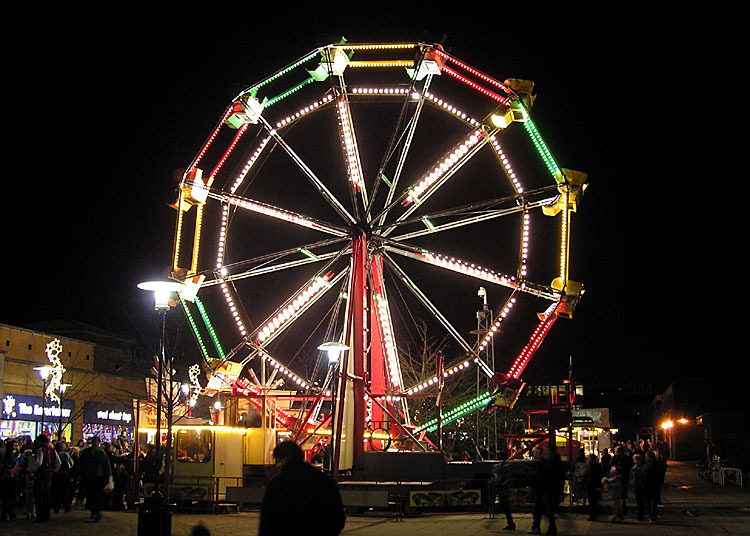 The Carnival also includes my post on cancelled festivals and broken windows, and Will Davis post at APR on the story of the Elk River Power Reactor. The Elk River post is part of a new series: APR Atomic Journal, including technical and historical pieces about nuclear energy. 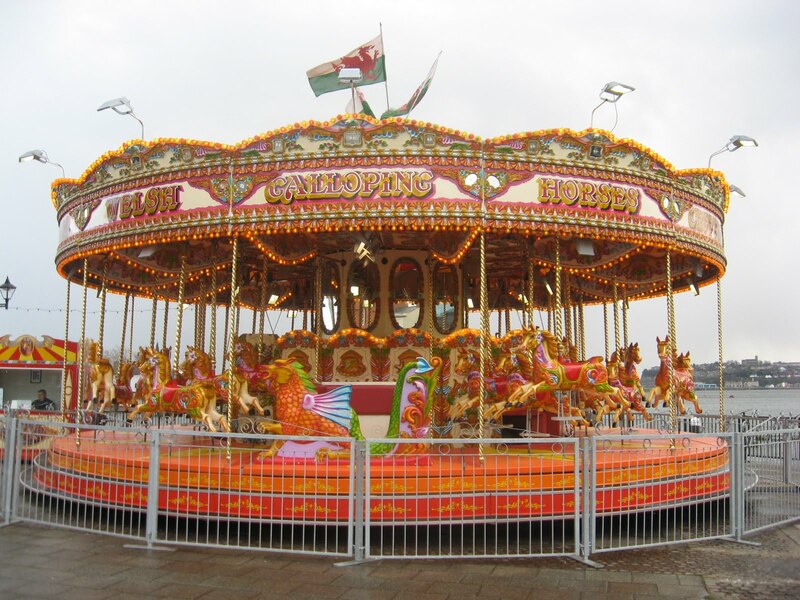 Come to the Carnival! Fun! Upbeat blog posts! Solid technical nourishment! Everyone is welcome! The Broken Window Fallacy says that destroying something (breaking a window), and then fixing it (hiring a glazier), stimulates the economy. The broken window fallacy was first described by the French economist Bastiat in 1850. In the broken window story, a hooligan breaks the baker's window. The baker then pays a glazier to fix his window. However, this does not stimulate the economy. If the baker didn't have to pay for fixing his window, he might have bought something else (a new suit from the tailor) with the money. The point of the broken window fallacy is that we can see what we get after the window is broken. We see the glazier getting paid. However, we can't see what we don't get. We can't see the the tailor not being paid. There has been a lot of destruction of roads and property in my township. Irene broke the windows, for sure. However, it is a small town, the money has to come from somewhere, and this article in the Valley News describes the "unseen." The article describes some of the things my town had hoped to do, but will not be doing in the near future, because we have to fix the roads. After Irene, the town will see people employed on the roads, but people will not be employed to improve the municipal building or ice rink. What we don't get is visible in this case. We won't have a festival, we won't have a good ice rink, we won't have insulation in the municipal building. We will get the roads fixed, but we will be poorer (less fun, no improved town infrastructure) due to Irene's broken windows. The "unseen" is visible in my township, and it isn't pretty. In recent weeks, I wrote two articles on the jobs effect of nuclear decommissioning. Governor Shumlin repeatedly states that decommissioning Vermont Yankee will be a great jobs bonus and economic stimulus for the southern part of Vermont. He claimed that "several hundred" plant workers would continue to be employed for "five to six years." The Governor also said that decommissioning would "fuel the economy" of southern Vermont by a billion dollars over ten years. Who is the Glazier in Decommissioning? Decommissioning a working power plant is like throwing a brick through a window. It doesn't take many highly skilled people (compared to running the plant). It doesn't take much money (compared to running the plant). and/or the higher cost of power bought from out of state. Out of state power is far more likely: we are already buying nuclear power from Seabrook. 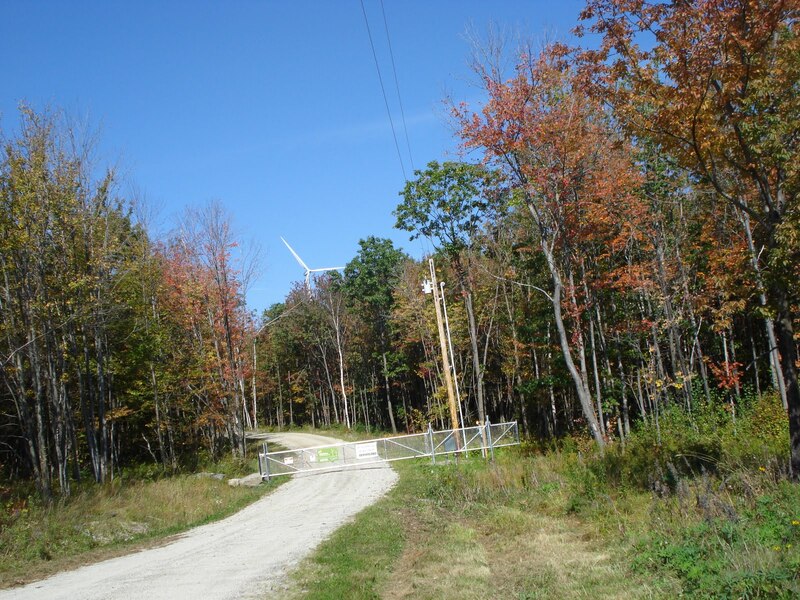 New power plants and transmission lines in Vermont usually attract fierce opposition. I think we will buy from out of state. Governor Shumlin practically commutes to Canada, setting up new power deals. Vermont will spend our money on out-of-state glaziers. We will see the money be spent, money that could have "fueled" the Windham County economy for twenty more years. What we would have spent the money for, here in Vermont...that will be unseen. In a recent post, I described the broken window fallacy in terms of the possible job stimulus of Hurricane Irene's destruction, or of decommissioning a nuclear plant. In both cases, destruction is not a job stimulus. I also have two articles on decommissioning. My first article, Decommissioning Vermont Yankee: the Governor vs. The Facts, appeared in True North Reports on August 14. This showed that 80% of the plant employees would be laid off within six months to two years. My second article was posted yesterday: Will Decommissioning Vermont Yankee Funnel a Billion Dollars into the Vermont Economy? The answer is "no." In a ten-year period, about $200 million can be expected in salaries for contract workers decommissioning the plant. If the plant is running, in ten years, $650 million in salaries are earned by plant employees. In other words, plant-related employment would drop by about two-thirds. Scarcely an economic boom! Many towns in Vermont will take a long time to recover from Hurricane Irene. My family and my home are fine, but I live in Windsor County. 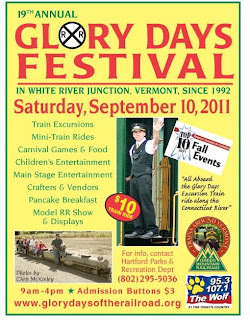 Here's Vermont Digger's article about Windsor County: Stately Windsor Country Towns Wracked by Irene. That news is several days old, and several of the towns now have power back, but it gives you an idea of what has happened. If the hurricane wasn't enough to depress me, I was also working on my second article about decommissioning. 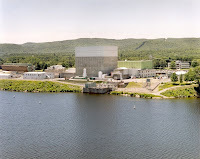 My first article on the subject has been published at True North Reports: Decommissioning Vermont Yankee, the Governor vs. the Facts. Governor Shumlin had said that decommissioning Vermont Yankee would be a huge jobs bonanza for southern Vermont. In my article, I showed that the workers at Vermont Yankee would mostly laid off within six months to two years of plant shutdown. Shumlin had said hundreds of plant workers would still have jobs for many years. This week, I worked on a second article to answer the following question: Though the plant people will be laid off, will contract hiring be a real job burst? I finished the article, and it will be posted at True North Reports next week. I won't keep you in suspense. The answer is "no." There won't be tons of new hires, and decommissioning will not be a jobs bonanza. As I was writing the article, I felt that something was missing. The amount of money that would be spent on decommissioning wasn't the biggest issue. Decommissioning the plant is destroying something. Even if if the process provides jobs (and it provides very few), I felt there was something wrong. Then, in my local paper, I saw a Tony Auth cartoon about the hurricane. The cartoon shows a flooded house, with a tree down on top of it, and several workers near it. The workers are wading through water toward the house, and one says to another: "Finally, a second stimulus." I realized what the problem had been about my decommissioning research. "Jobs from decommissioning" is just the Broken Window Fallacy in a new guise. Destruction is not a stimulus. The Broken Window Fallacy is the idea that if something is destroyed, rebuilding it stimulates the economy. This is not true, which is why it's a fallacy. As the video below illustrates, after the money has been spent for rebuilding, you are merely back to square one. No real value has been added. Similarly, decommissioning a power plant takes away the plant's ability to create something valuable (electricity) and returns the land to being a pasture. We have plenty of pastures in Vermont. A new pasture won't add much, but taking away our one major power plant will subtract a lot. Looking at the "jobs created" during decommissioning is like being happy that the stone hit the window in the video. As the video says: "If throwing the stone through the window is a stimulus, why not go further? Why not burn down the town?" Hurricane Irene has done huge amounts of damage to Vermont. The state will test the Broken Window Fallacy with the destruction caused by the storm. Will this destruction be a jobs stimulus? (My own answer is "no.") Vermont doesn't have to do even more damage to itself by shutting down our major power plant. End Note: This video ends with the idea that any money that the government spends hurts the economy. This is an oversimplification at best. I wish the video had not ventured into tax policy, but just made the one point that is the heart of the Broken Window Fallacy: Destruction does not stimulate the economy. 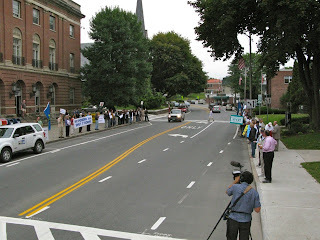 This opinion piece by Richard Schmidt ran as an editorial in the Brattleboro Reformer on August 26, 2011. Mr. Schmidt was kind enough to allow me to post it on my blog. 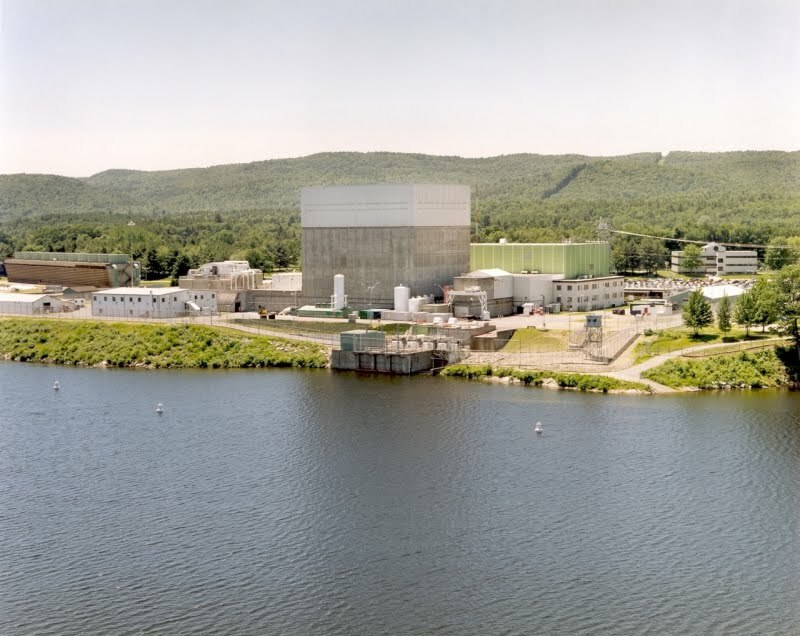 Recently, the Vermont Department of Health (DOH) received a routine test report on one fish that was caught in the Connecticut River nine miles upstream from Vermont Yankee nuclear power plant in Vernon. The edible portion of this fish contained a very low but surprising level of radioactive strontium-90. The DOH regularly monitors the environment for many such "radionuclides" to detect possible leakage from Yankee. This analysis of fish is part of that program. Strontium-90 is a fission product that has spread throughout our environment predominately from pre-1964 nuclear bomb atmospheric testing, and is dissipating slowly with a 29 year half-life. Because strontium-90 is "hard to detect" and was detected in only one sample of fish flesh, a scientist will term such a result to be an "outlier." It lies outside of the norm. This subjects the sample and test process to scrutiny, and the result is held until further review. This is exactly what DOH has done by calling for more fish samples. DOH said that they cannot associate low levels of strontium-90 with Yankee without supporting evidence. The DOH website also states that the result is "within the range of background strontium-90 in edible portions of fish reported in a 1971 study," prior to Yankee's startup. Also, according to U.S. Department of Health "strontium-90 is a fairly constant part of the U.S. diet," and New York State has found similar strontium-90 levels in fish. By taking more samples, DOH is doing a professional job and maintaining a scientific perspective on the matter. But in a press conference found on YouTube, Governor Peter Shumlin blew this matter out of perspective when he called the strontium-90 level "high," attributed it to Yankee, and said that he would not eat fish from the river, although he did so as a boy. He said this despite contrary information from his health department, and despite unwarranted damage to tourism. It appeared that his only purpose was to discredit Yankee. This brings up two questions. The first is about strontium-90 levels over time. According to the DOH and other sources, the strontium-90 levels in fish that Gov. Shumlin ate as a boy were up to 20 times greater than the levels in this fish because radioactive decay and dispersion have since reduced the radioactivity. 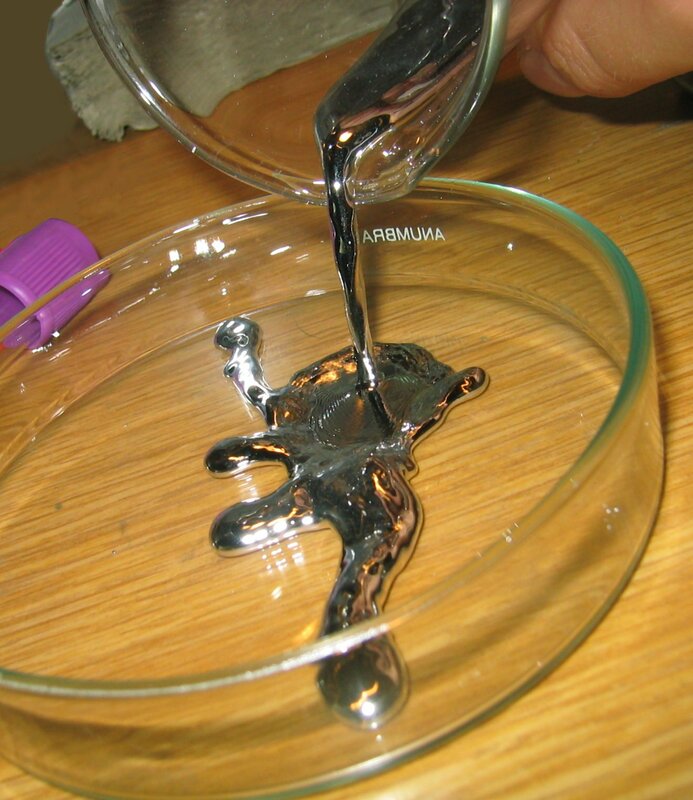 The more significant question is about highly toxic mercury in our fish. Mercury in our environment is primarily due to coal-burning power plants, as coal contains mercury that is released from coal plant stacks. Vermont and New Hampshire and most states issue advisories to limit the eating of locally caught fish due to mercury. For example, the N.H. 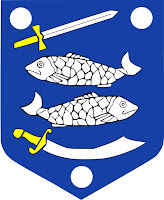 Fish and Game Department warns against eating more than four wild-fish meals per month, restricted further to one meal per month for children and pregnant women. Children and the unborn are particularly sensitive to this neurotoxin. There is no direct connection between mercury and Yankee because the plant releases none. But if Yankee is shut down, its power will be largely replaced by low-cost coal power. Unfortunately for us, most coal plants are to the west of us; New York has 48. The prevailing winds will carry more mercury, cadmium, arsenic, particulates and other pollutants to our environment, to the detriment of our health. The Environmental Protection Agency wants stronger pollution controls on coal plants. It estimates such controls would reduce deaths in the U.S. by 17,000 per year and reduce related illnesses. Before making public statements about the fish, the governor should have asked "Is this strontium-90 significant?" Let's compare the fish's strontium-90 radioactivity to the natural radioactivity that we ingest with fish and other foods, which contain the essential nutrient potassium and its inseparable radioactive isotope potassium-40. A person eating the DOH fish sample would ingest about 2 percent of the radioactivity (6 percent of the radiation risk) from the strontium-90 relative to the natural potassium-40 in the same fish. Interestingly, natural potassium-40 makes our bodies about as radioactive as that fish in the news. In truth, neither the strontium nor the potassium are significant hazards at all. The question "Is this material significant to my health?" was completely lacking in this case. The real health impact of Gov. Shumlin's statements is to encourage the burning of more coal and the continued mercury pollution of our fish, our bodies, and our biosphere. Richard Schmidt is a chemical and nuclear engineer and energy consultant who is not associated with Vermont Yankee. He lives in Westmoreland, N.H. Fish shield image is the coat of arms of Narva, Estonia. The Shumlin press conference video is also on one of my earlier blog posts.